I’d like to tell you I’ve made macarons today. I had planned to. Really. Last week, we bought mandelmjöl [ground almonds] and florsocker [icing sugar]; mjölkchoklad [milk chocolate] and vispgrädde [whipping cream]. But you see, we’ve been for walks everyday. At times, in the forest. Or by the river. And, always, in the snow. And the chocolate bars we wrapped in foil – along with kokkaffe and the old kaffekanna [coffee pot], perhaps a square or two of Tatin tart salted caramels too, and a few baconost [bacon cheese] sandwiches that K. loves to make with lingonbröd [lingonberry bread, which I’ve seen an amazing recipe for here, and I can’t wait to go pick lingonberries to make it] – well, they’re gone. Yes, I wanted to make moka macarons, but we’ve eaten all the chocolate before it even got the chance to be turned into a whipped ganache, just so. When I realised I had never posted a recipe for macarons, I couldn’t believe it. It’s not like I haven’t spent the last seven years of my life making some almost daily. Pistachio and vanilla were ranking high amongst all. But I’ve also made some with elderflower and champagne, fermented mango, coconut and lime, salted caramel, avocado and chilli, pumpkin and cinnamon, rhubarb and cream. Even beetroot and orange ones. The list could go on for – almost – ever, really. And that’s what I love about macarons, how versatile they are. 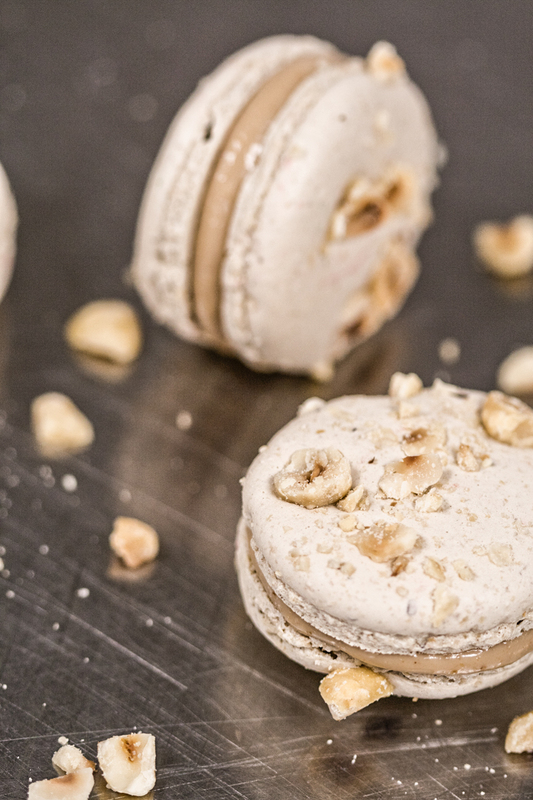 These ones are made with caramelised white chocolate – a love of mine, and roasted hazelnuts. At times, I like to fill my macarons with a crémeux instead of a ganache to lower the sweetness slightly. However, macarons made with crémeux will only keep for a couple of days in the fridge before getting a bit too moist. They will keep beautifully frozen though, and judging by how many times I’ve seen our container in the freezer getting emptier and emptier, I’m sure some chefs – whose names will remain undisclosed – can vouch for it. 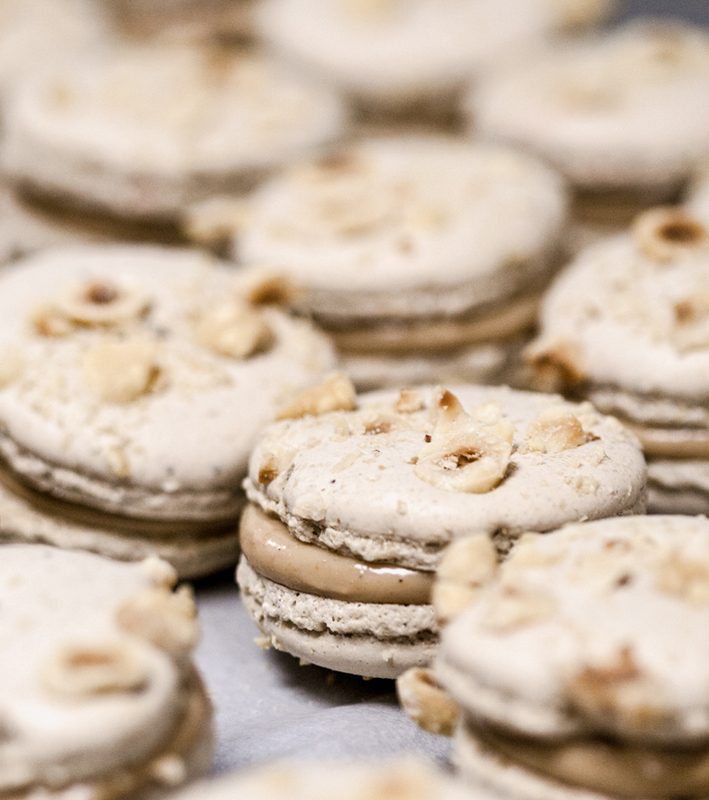 The recipe for the shells is adapted from Andrew Gravett’s beautiful macarons. He’s an amazing pastry chef and person, and I couldn’t be anymore grateful to have followed him in one way or another during my six years in London. It’s super-foolproof. And trust me, this is something you want your macarons to be. The stages are quite simple really: start by making a smooth tant-pour-tant, for this I like to use extra fine ground almonds as they give a more flawless finish. Then make an Italian meringue, which you fold into the almond mixture and the extra egg whites. After all is incorporated, you’ll deflate the batter slightly. This step, called macaronage, can be done with either a maryse or a plastic scraper. I like to use a plastic scraper and push the batter against the sides of the bowl until I have the correct texture. Now, it’s quite hard to describe the texture of the finished macaron batter: it should almost form a ruban and when the batter drops, it should smooth out into the rest, leaving only the tiniest bump. If you’d like I could write a little post about macaron troubles and what they mean. Perhaps we’d call it the macaron doctor? – flat and odd shaped macarons with bubbles mean your batter was over-mixed. – gritty macarons with a pointy top means your batter was under-mixed. – cracked shells can mean two things: too much humidity in your kitchen/oven or your oven temperature is too high. – shells that stick to the silicon mat: try to bake them a minute or two longer. Preheat the oven to 180°C/fan 160°C. Place the chopped chocolate onto a baking tray lined with a silpat. Bake for 8 minutes, or until the chocolate is golden-brown. Take out from the oven, and using an off-set palette knife, work the chocolate to even out the colour and smooth it out. Allow to cool down while you get on with the rest. Preheat the oven to 165°C/fan 145°C and roast the halzelnuts for 20-25 minutes, or until golden-brown. Save 100g to chop for decorating shells. And blitz the remaining 200g in a mixer until you have a smooth paste, around 8 minutes. This will make more than you need, but you can keep it in a container in the fridge for later use. Soak the gelatine in ice-cold water. Place the caramelised white chocolate and hazelnut paste in a bowl. Bring the milk and cream to the boil. Pour onto the egg yolk, whisking as you do so. And return to the pan. Cook over low heat to 80°C, stirring at all times with a silicon spatula. Off the heat, add the squeezed gelatine. Then pour onto the white chocolate in three times, emulsifying well to create a glossy core. Handblend for 3 minutes to emulsify further. Transfer to a container and clingfilm to the touch. Chill for at least 4 hours or up to 3 days. In a small blender, blitz the icing sugar and ground almonds for a couple of minutes, pulsing so it doesn’t overheat the nuts. Tip into a large bowl and add the egg whites. Mix to a smooth paste and cover with a damp cloth. Place the sugar and water in a small pan and cook over medium het to 118°C. When the syrup reaches 110°C, start whisking the egg whites on low speed. When soft peaks form, add the caster sugar, a little at a time, keep on whisking until stiff peaks form. Wait for the syrup to stop bubbling – around 30 seconds or so – and pour over your meringue, whisking as you do so, along the sides of the bowl to avoid splashes. Once all the syrup as been incorporated, increase the speed to medium and keep on whisking until the meringue is around 50°C. Add the meringue to the almond mixture and fold in using a maryse. Then deflate slightly until you get a ribbon. 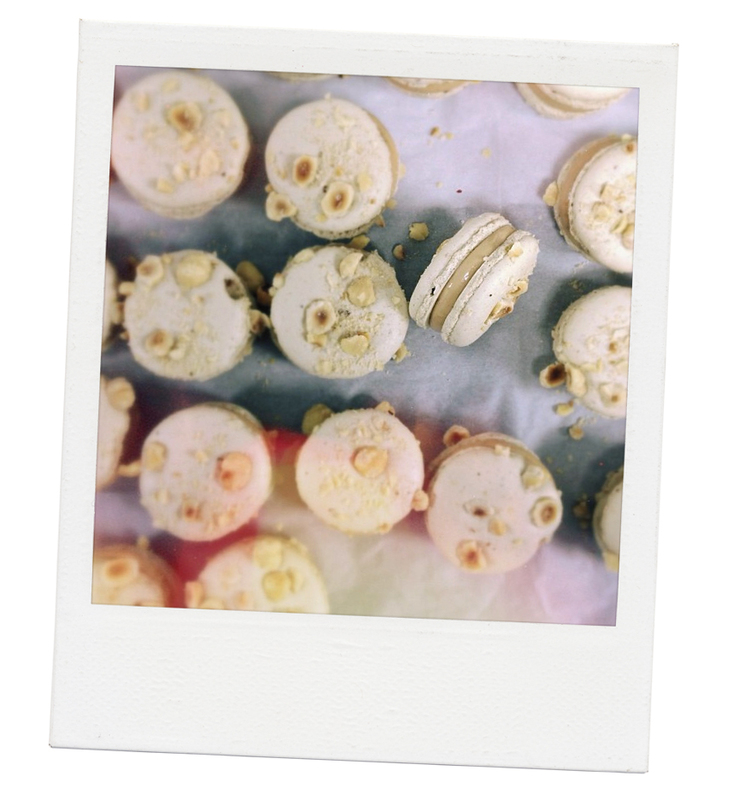 Pipe the macarons using a 9mm nozzle onto a baking tray lined with a silpat. 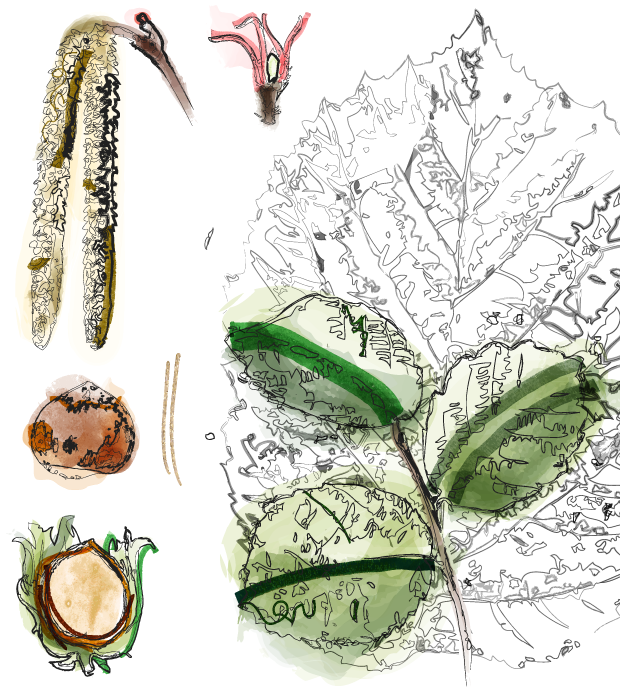 Around 3cm wide. Immediately sprinkle with chopped hazelnuts. Leave the trays at room temperature for around 30 minutes, or until a skin forms and the macarons no longer feel tacky. Bake at 160°C/fan 140°C for 12 minutes. Allow to cool down completely, then turn the macaron and fill them with the crémeux using a 11mm nozzle. Freeze on a baking tray, then put away in an air-tight container. Caramelized chocolate is dreamy, I make an ice-cream with it… So irresistible ! Great taste! Balanced salty/sweet macarons!! Thank you for the recipe!! Just made it with the help of a friend. It came out really good. I was surprised how good home made macaron can be.